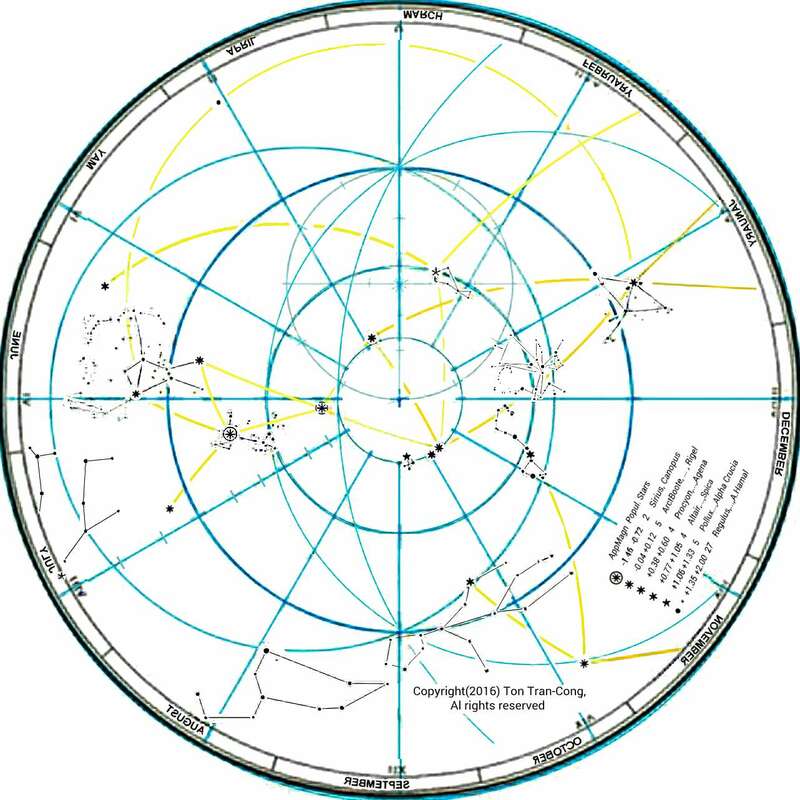 Figure: The sky map for use in Northern hemisphere. The method here uses stars for finding base city at a distance between 1000km to 9000km and for traveling to that base using constant latitude for final path. It uses the stars passing overhead the base city and accurate time to tell those moments. Direction and distance to that city are directly observed from the stars. If no current longitudinal information is available and longer travel distance is acceptable then the user can also use this method to aim for base city on the final constant latitude part of the travel. A. People who are lost in the ocean or in a large desert with no reliable landmark. They need some method of orientation using minimal number of tools. B. People drifted to an isolated island in the ocean after a tsunami ! C. Installers of long distance or satellite communication antennas wishing to aim their devices when not having any map. 1. Selected star(s) for the chosen base city with the target point(s) underneath the star(s) reasonably close to the base city. 2. Longitude of the base city and time signal announcing GMT time to show the time at base city. The time signal may come from Broadcast or Marine Band Weather Radio. 3. or an accurate watch that allows determination of the true (not zonal) time of base city (Each minute earlier or later than intended time may cause a longitudinal error of 0.25 degree that is about 27km near the equator.). 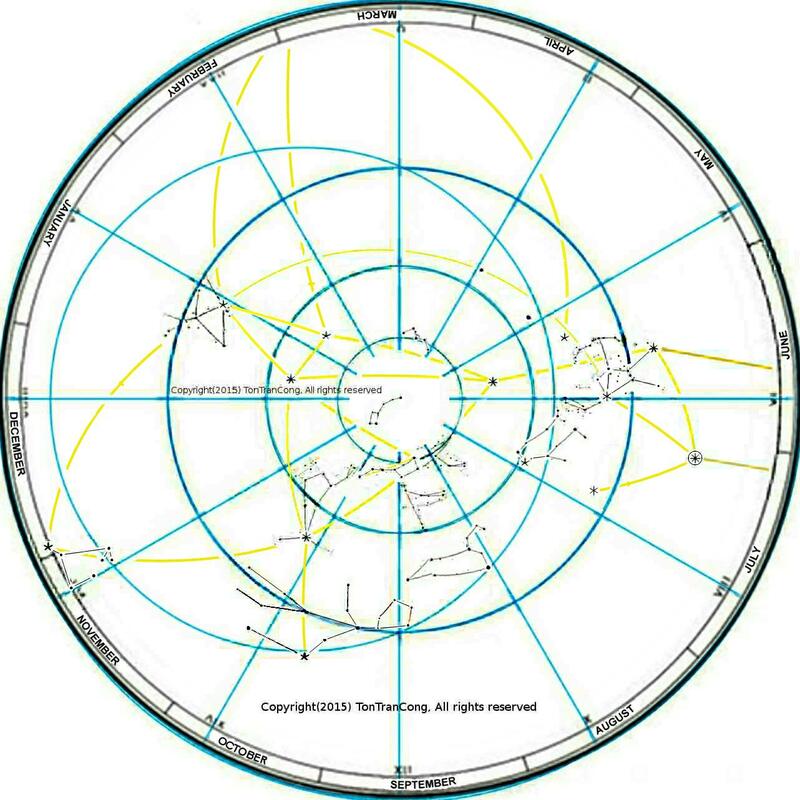 Figure: The sky map for use in Southern hemisphere. 1. 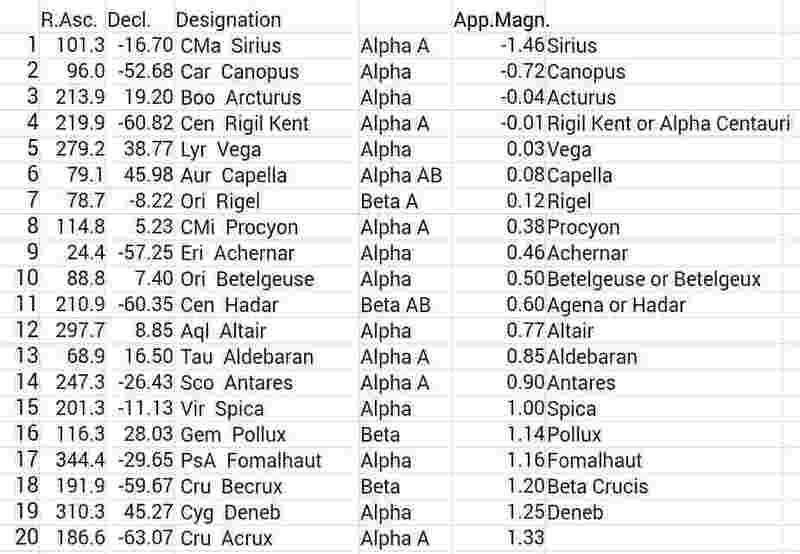 Search from the list of brightest stars (in descending order) for the brightest identifiable star that can closely pass overhead the base city (with acceptable error distance) and the approximate date for it to be seen in at midnight. London is at (0°5′ longitude, 51°32′ latitude). In June, choose Eltanin (Gamma Draconis, 17hr 57′, +51.5° declination) target point underneath the star is 0km from base. Berlin is at (13°25′ longitude, 52°30 latitude). In June, choose Eltanin (Gamma Draconis, 17hr 57′, +51.5°declination), target point underneath the star is nearly 110km South of the city while the zenith of the city is 2 Moon’s diameter from the star and toward the Celestial North . In December choose Gamma Persei (03hr05RA +53.5degrees declination, app magn 2.91) target point underneath the star is nearly 110km North of the city while the zenith of the city is 2 Moon’s diameter from the star and toward the Celestial South. Mecca(39°45 longitude, 21°29 latitude) choose ArcturusBoote (213.9RA, 19.2° declination) nearby location underneath the star is 230km South of the city while the zenith of the city is 4 Moon’s diameter from the star and toward the Celestial North. Manila (120°57′ longitude, 14°35′ latitude) choose Regulus, (Alpha Leonis, 10hr08’RA +12.0°declination) nearby location underneath the star is 280km South of the city while the zenith of the city is 5 Moon’s diameter from the star and toward the Celestial North. 2. Work out the day for the star to be highest at midnight. The day is the same for all locations. It is almost Sep23rd plus the RA of the star multiplied by (365.25days/360°). Sep23 + 46.92days = Oct23 + 17d = Nov 09. 3. Learn by heart how to identify in the sky the stars associated with the base city. The accuracy and speed of this ability is essential to avoid mistakes under adversed circumstances. Users should not confuse between stars near the ecliptic and wandering planets nearby. 4. Practice determining the time when the star passes the vertical North-South plane at the base city on that date. It is midnight minus the local advance on GMT, which is equal to longitude multiplied by (24hr/360°). 24hrGMT – 0.89hr = 23.11hrGMT = 23hr07GMT. 5. Every day later/earlier than that date, the star passes the location (60minx24/365.25) = 3.942 min of time earlier/later. This earliness is observable at all locations including your current one. When observing the star on another day, the earliness adjustment is needed. 6. If the Sun crosses the North-South vertical plane earlier/later than at base, the chosen star also crosses the North-South vertical plane earlier/later than at base by the same amount of time. List of 20 brightest stars. Additional, dimmer stars are also needed to travel closer to any arbitrarily given latitudes. 8. At that moment, the star is above the nearby spot close to the base. Every degree from your zenith is 111km distance from you. The direction to the star projected onto the ground gives direction to the chosen nearby location. To obtain more accurate direction to your base when the star does not pass its zenith, you can imagine another star at some diameters of the Moon on either North or South side of the RA circle from the chosen star and use it instead. Alternatively you can add some adjustment based on the differentials on a spherical surface to obtain the exact direction to your base. Step 3: Navigating by only stars. 9. To travel to the target location, aim for a location on the same latitude but more in the North-South direction of the current point. This makes the travel distance longer but ensures that the target is not missed in the final part of the travel. When arriving at that target latitude, aim at the target location. Keeping the selected star on the East West line when it has highest altitude will ensure that the traveler does not miss the target. This method suggests a possible way used by desert travelers and an alternative for refinement of Polynesian method of navigation. 4. How to find the zenith point. The navigator has to hang a long plumbing line from a point higher than his eye level, stand away from it and look at the projection of the line onto the sky. The projection is a great circle arc through the zenith. Looking at the plumbing line from many directions gives many great circle arcs intersecting at the zenith point in the sky. The navigator may have to note its relative distances to familiar stars and draw it and the stars on a piece of paper for future reference and cross checking. This method requires a steady plumbing line and is suitable for ground travelers when resting at night. 5. How to locate any chosen bright star in the sky. 1. Find out its position relative to the 20 brightest stars by plotting it on the star maps here from its RA and declination. 2. Work out steps starting from identifiable top 10 brightest stars to positively identify it through progressively nearer, easily identifiable, bright neighbours . 3. 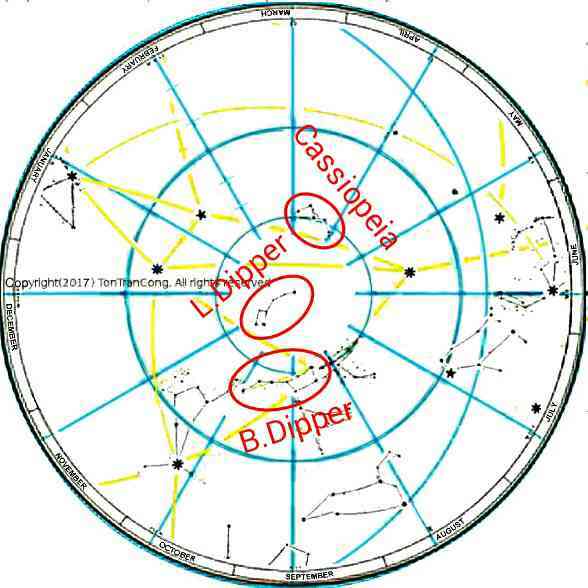 Use the sky maps here to practice finding it in the sky. 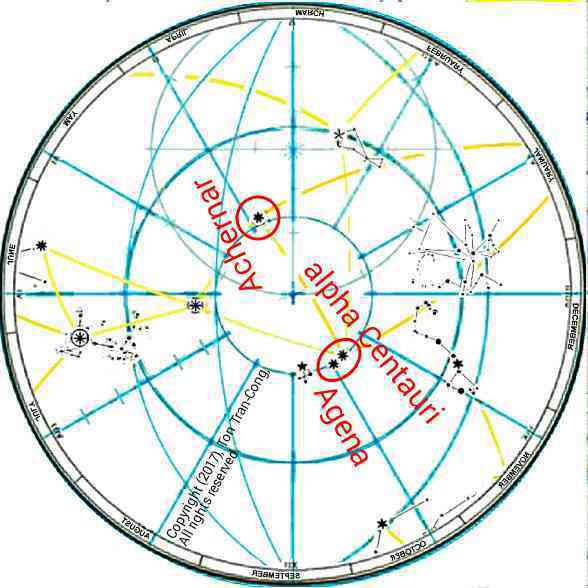 Eltanin is found from star charts and the sky maps here as the brightest star near to the point of one third of the way from Vega to Dubhe (There is no brighter star in the vicinity.). The broom shaped group of stars (Sirius, Canopa, Orion-Rigel, Betelgueuse, Procyon) identifies their elements. Betelgueuse-Pollux forms the hypotenus of the isoceles right triangle (Procyon, Betelgueuse, Pollux, Procyon, counter-clockwise) with Procyon at the right angle. Regulus is then one distant vertex of the rhombus (Procyon, Betelgueuse, Pollux. Regulus, Procyon, counter-clockwise). 1. The local true time at the base city has the Sun crossing the North-South vertical plane at 12am. The zonal time (broadcasted by local radio and TV stations in the winter) is the true time advanced or retarded so that it differs from GMT by a whole number of hours. 2. The Sun crosses the North-South vertical plane before or after 12am zonal time by the difference between the local true time and zonal time. This amount is due to the excess or shortage of longitude to the nearest multitude of 15 degrees chosen for zonal time. 3. With an accurate watch still showing the zonal time at the base city, the longitudinal increment from that of base city can be worked out by the increment in the earliness of the crossing of the North-South vertical plane by the Sun. Each increment of 15 degrees in longitude corresponds to 60 minutes advancement in noon time. 4. Near to the end of the journeys, overland navigators may apply terminal homing using mega-features such as familiar city silhouettes, mountain peaks, rivers, rock and soil formation, permanent cloud formations, existing or ancient tracks, vegetation boundaries or even smell from plants. Some traditional land travelers may even release trained eagles to home on prairies while some traditional ocean travelers may release islands spotting birds to home on islands. Finding time to Sunrise is needed for traveling across deserts as the travellers may want to be on time to avoid excessive heat and coldness. It is also needed by long distance traders and country people who have to schedule their peak activities around Sunrise time. Finding time to Sunrise is harder than to Sunset because the Sun is not seen before Sunrise (for people in tropical and temprate zones)! This method relies on the symmetry between Sunset and Sunrise to work out the time to next Sunrise using a circular sky map. Use two rocks or a stick lying on the ground to mark the direction of the setting Sun. The interval from Sunset to alignment of star maps may be significant (See the note at the end of step 5.). 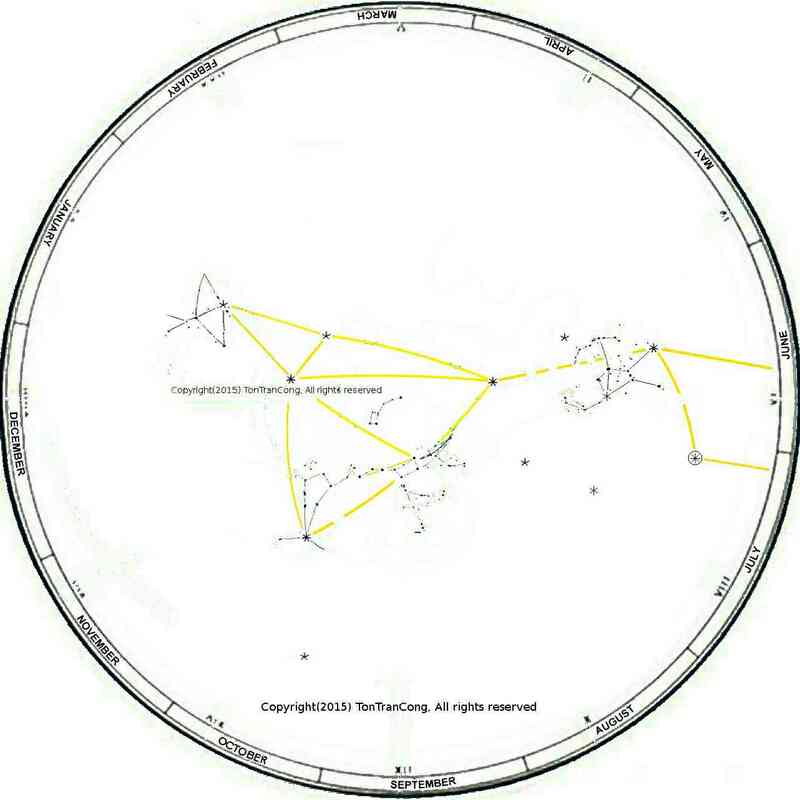 Figure 1: Aligning the sky map to the stars and Celestial axis OP. 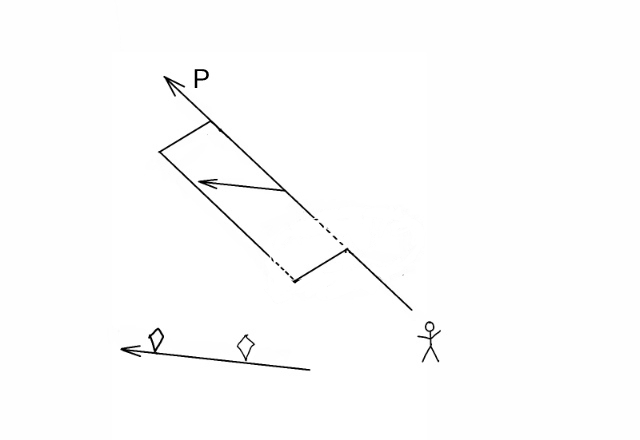 Figure 2: Constructing the half-plane containing the Celestial axis OP and the half-line pointing to Sunset position. Figure 3: The intersection between the sky map and the Sunset half-plane gives the radial line OC. Accurately align one of the star maps (such as of this article) to the stars and align its axis to the Celestial axis so that it points to the upper Celestial pole P. Work out the half-plane of constant R.A. containing the Celestial axis and the Sunset direction half-line. This half-plane intersects the polar sky map along a radial line which is often non-horizontal. Use a paper clip to mark the intersection C of the rim of the star-map disk and the half-plane. 4. Stop the stop watch. 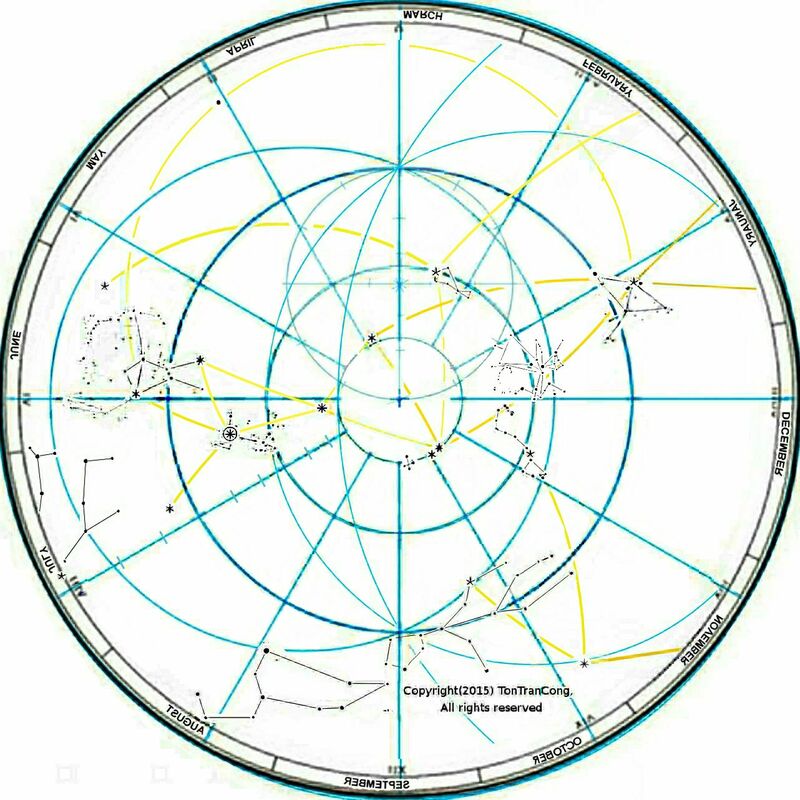 Figure 1: The sky map for use in Northern hemisphere. 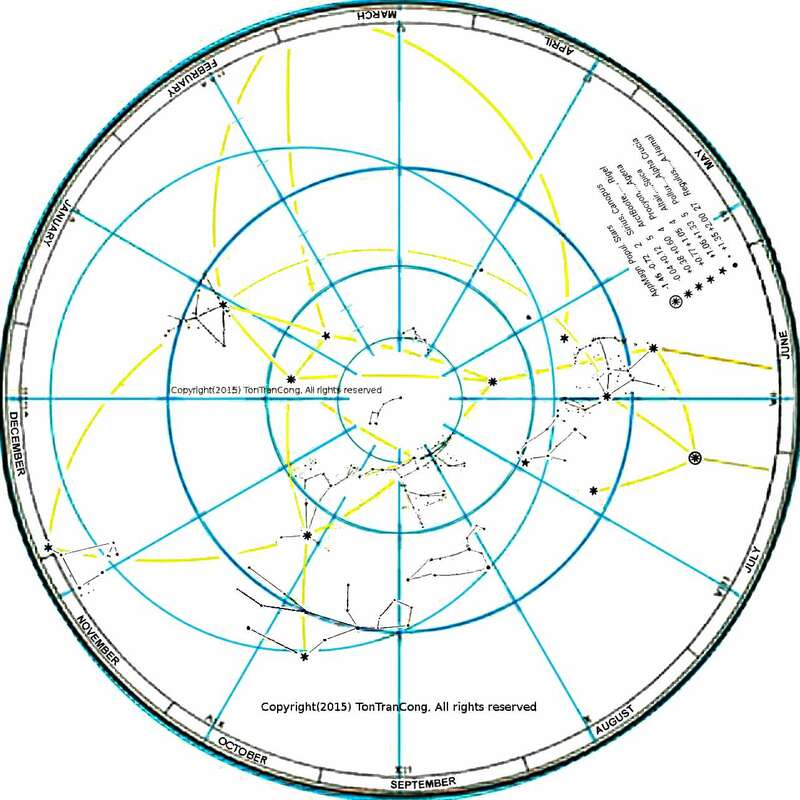 Figure 2: The sky map for use in Southern hemisphere. Stop the stop watch and note the time from Sunset to time of alignment of the sky map. This time varies from 5 minutes in the tropic to nearly one hour in the cold temperate zones (See the note at the end of step 5.). Use the stop-watch reading to determine the small amount of time from Sunset to the successful alignment of the star map. The paper-clip on the rim should be moved to a new position toward the bottom of the sky map by an angle corresponding to the time interval given by the stop-watch. The paper clip should now be on the R.A. half-plane containing the Celestial axis and the Sun. The Sun has moved further down under the horizon corresponding to the rotation of sky map since Sunset to alignment time. The stop-watch of steps 2, 4 and 5 is not necessary if the rotation of the Celestial sphere during that time interval can be worked out by any other mean such as from the rotation of an early Moon which is visible both before and after Sunset. 6. Coarse time to Sunrise. The rising Sun will be the left-right reflection image of the setting Sun through the true North-South plane . So are the two corresponding positions of the paper clip. The sky map will rotate during the night and the paper clip will move through the position for Sunrise. The time to Sunrise is the time for the sky map to rotate between its current position and Sunrise position. (One full circle is 24 hours). 7. Alternative coarse time to Sunrise by the late Moon. A late Moon remains in the sky until Sunrise. The shape of the Moon indicates the direction of the out-of-view Sun. The Celestial axis can be determined from the declination of the Sun and the local latitude. So time for the Sun to reach the horizon can be estimated. This method has been given previously. 8. Fine time to Sunrise. Observe the identifiable stars near the 90 degree Eastern horizon. They always rise up at the same angles (along the constant declination lines) from the same terrestrial directions on the horizon. Before the stars fade at Sunrise, pay attention to those that have risen about 1 to 5 degree from their rising positions and take notes of their travel (at angle to the horizon, along the constant declination lines) from the initial rising positions on the horizon. The stars rise 1 additional degree early for each subsequent day and new stars will appear to take their role. Using these stars close to the Eastern horizon, the time to Sunrise on subsequent days are determined with better accuracy. 1. The motion of a new or early Moon in the sky can be used to time the interval from Sunset to alignment of the star map (by checking its rotation with the sky map). A stop-watch is not required in such a case. 2. 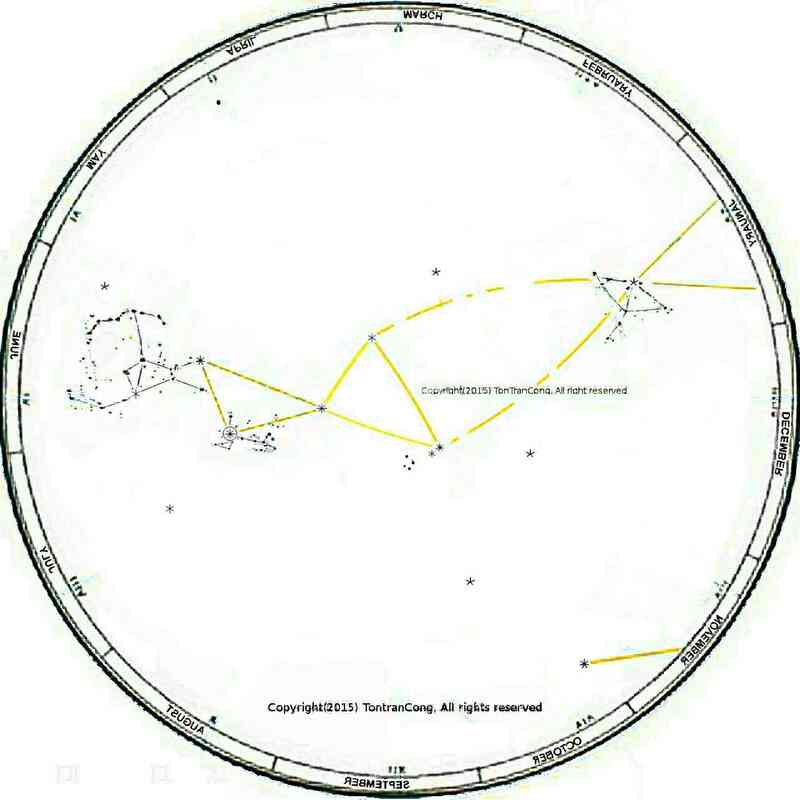 If a large sky map is drawn on a wheel mounted on its axis aligned along the Celestial axis then a time keeper only needs to align the sky map to the stars at night and the paper clip to the Sun during day time to read fairly accurate local time from the travel of the rim of the wheel. The paper clip will make one complete rotation everyday and its position on the sky map needs adjustment by only 1 degree each day.
. tonytran2015, Finding North and time with unclear sky, Additional Survival Tricks, http://www.survivaltricks.wordpress.com/ , posted Oct 17, 2015.
. tonytran2015, Finding time to Sunset with bare hands, Additional Survival Tricks, https://survivaltricks.wordpress.com/2015/11/11/finding-time-to-sunset-with-bare-hands/, posted Nov 11, 2015.